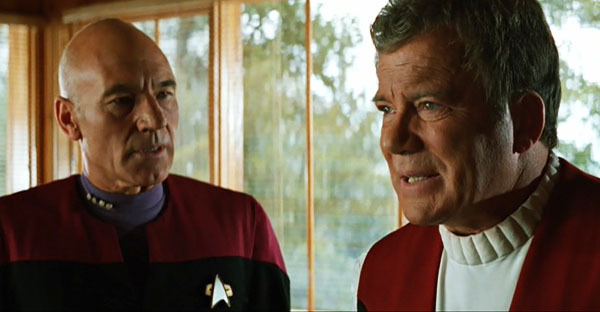 Seeing both Patrick Stewart’s Captain Jean-Luc Picard and William Shatner’s Captain James T Kirk on the screen, in the same adventure, was the stuff of dreams and fantasy for a lot of Star Trek fans. They were decades apart and the only real way this could happen was in fan-fiction, fan-movies and anything else made primarily by the Star Trek fan community. Star Trek Generations actually manages to achieve this though and as exciting as the prospect of the two iconic captains sharing the screen is, it never actually lives up to it’s potential or promise. The issue seems to be that the film is too geared towards this moment and bringing these two characters together that any other storyline pales in comparison. That isn’t to say there aren’t some decent plot points in the movie but they don’t amount to enough to warrant their inclusion. Stewart’s Picard is wondering whether he could ever live a “normal” or if he should have, Brent Spiner’s Data wants to be human and an emotion chip offers him this advantage while Shatner’s Kirk looks to undo the missed opportunities of the past. All of them are great sub-plots but they are only given lip-service when the “main plot” begins to drive forward. Unfortunately, the “main plot” surrounding Malcolm McDowell’s Soran trying to change the course of a rift in space to reach a “nexus” is a shallow one. It doesn’t have the depth or threat needed to make bringing two of Star Trek’s juggernauts together. Not to mention the fact that McDowell is really weak as a villain anyway. Regardless, that moment of Picard and Kirk, together at last, is one that should be treated with special gravitas. It should be a moment to savor and enjoy. It should be the highlight of the film. Unfortunately, it never actually lives up to the spectacle you want it to be. The two share minimal amount of screen time together and when they do, it is underwhelming, not delivering what many Star Trek fans have already written in their own heads. That isn’t to say Generations doesn’t have some discerning qualities. For starters, the opening which sets-up the “death of Kirk” is fantastic. It feels like Star Trek of old and seeing the classic cast members for one last time is very poignant, especially as they mourn their lost captain. Add to this the Next Generation cast on the big screen too. For many, this is their Star Trek and for their adventures to be continuing, albeit via movies, is a welcome one and the crew translate well. Generations also serves as a good passing of the baton between the two stages of the franchise. The final scenes between Picard and Kirk are done very well and Shatner gets to give his iconic character one lass hurrah. It is just a shame that the events which lead to this point don’t meet the same quality. 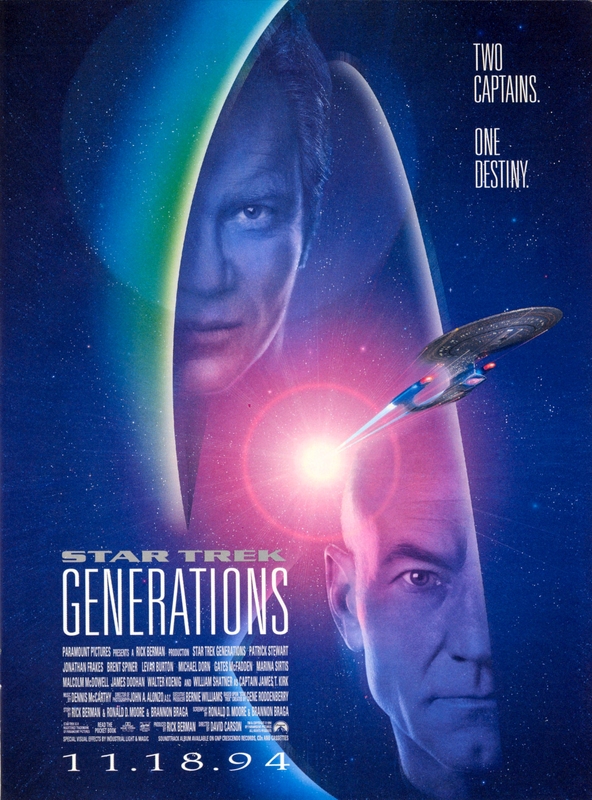 Overall, Star Trek Genertaions will always be known as the movie which brought Captain Picard and Captain Kirk together but not for much else. Their scenes lack the spark which you’d hope for, while the rest of the movie flounders around them, without enough plot to justify the two coming together at all. yeah, loved this movie-event on a sci-fi convention here in Brazil. People cheered on the screen like a soccer game.